Update: This is now confirmed. EMI is offering its entire digital music catalog via iTunes DRM-free. Songs will be $1.29 each. The Wall Street Journal seems to know a bit more, though. They say (behind a paywall) that the two are set to announce that a significant portion of EMI’s catalog will be sold online without any DRM. EMI is the third largest music label after Universal and Sony. Labels like DRM because users can’t easily copy songs to give to friends. Users hate DRM because they are locked in to one device or service. Earlier this year Jobs wrote an open letter to music labels calling for them to “abolish DRMs entirely.” In that letter he noted that only 22 out of every 1,000 songs on the average iPod, or less than 3%, were purchased from iTunes. The rest were ripped from CDs and obtained illegally. Given the plethora of illegal services for obtaining DRM-free music for free, DRM-laden online digital music sales haven’t grown fast enough to offset plummeting CD sales, which down 20% in the last year. A billion songs a month are downloaded, mostly illegally, from P2P networks. 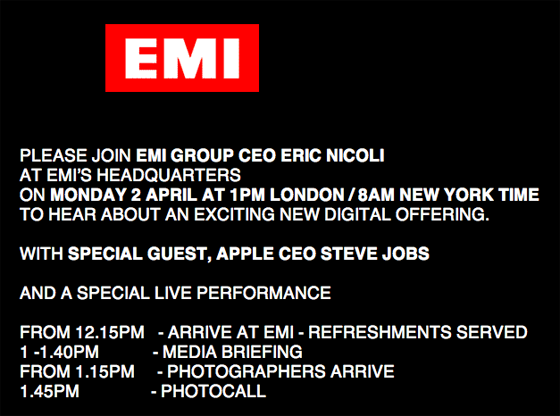 If EMI does in fact announce that they will sell music without DRM, Jobs is going to get most or all of the credit. If sales increase, expect the other three big music labels to join as well. And April 2, 2007 will be a day music fans remember forever.